I see Rey becoming a new type of Jedi, one that doesn't look down upon emotional connections and isn't quite so polarized in her thinking. Grey Jedi maybe - there is a quote relating to this at the beginning of the TFA novel. Both Rey and Kylo struggle w/ the light and dark within, albeit in different ways. I can't see either of them being traditional Jedi, but I'd like to see them reinvent the concept of being a force user. I'm not a big fan of the execution of the cave scene.. but it was an extremely significant moment for her character. Rey is such a stoic and persistent character - that it can seem that the challenges in her journey don't touch her. Especially when she keeps fighting and smiling and doesn't give up. This new slide, for me, highlights how devastating this 'answer' from the force was for her. 'crushed' is such a powerful description of her pain and experience in the cave scene, and the suffering that she has always carried with her thanks to her parent's actions. I think at times, I gloss over this and don't fully acknowledge this as part of Rey's character. Kylo/Ben's suffering seems to be so deep and visceral, maybe it is that his character harnesses his suffering and uses it to focus - in oh so painful ways. Whereas Rey tended in general to minimise, deny or bury her suffering instead. 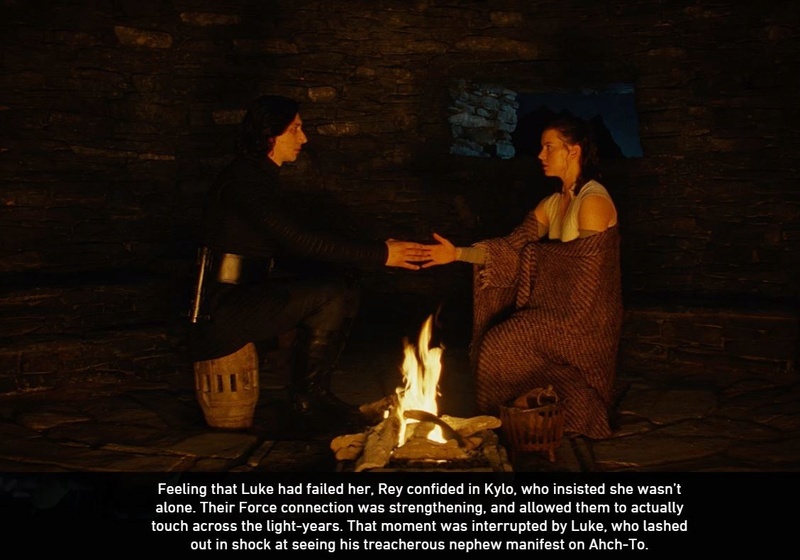 But the hurts are just as real to her.. [though in the throne room I'm thinking she takes a leaf out of Kylo/Ben's book and harnesses her suffering to fight Snoke. What do you think? I wonder if this indicates a shift for her character.. hmm.. ] Given the awful things she experienced on Jakku it's telling that this cave moment left her more alone than she had ever been on Jakku. Maybe this is partly because she is growing up and beginning to face the truth of what happened with her parents - this means experiencing the hurt and the loneliness she buried for so long.. Anyone else have thoughts about Rey and the cave scene? Reading the novelisation has sparked my interest in Rey again... so I'm using my SW time today to play around with it a little here..
Rey is resilient but at the same time, we saw her suffering a great deal in TLJ. Maybe it's just me - but I haven't really stopped to think of what it was like for Rey to be confronted with Snoke. Because she is resilient, her suffering can be underestimated easily I think. On top of the whole parentage gut punch - Snoke played with Rey cruelly. Rey was thrown up in the air and tortured by Snoke!! Poor Rey!! 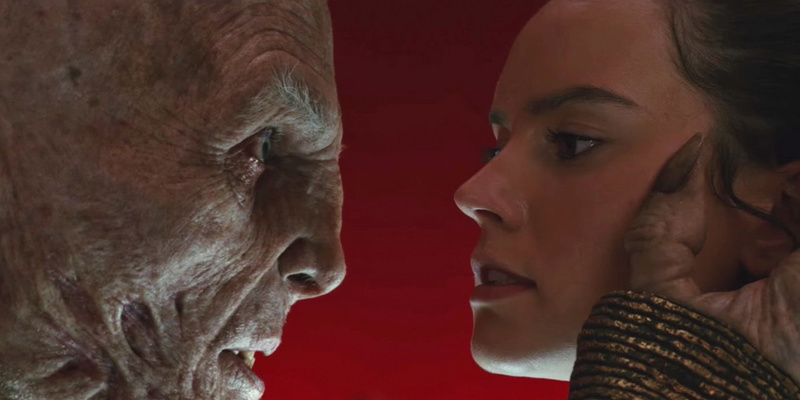 We don't have much of a chance to see what this was like for her, because events move so quickly - but to have encountered Snoke and found that he was more powerful, he bested her and was going to kill her, would have been an extremely intense and distressing experience for Rey. 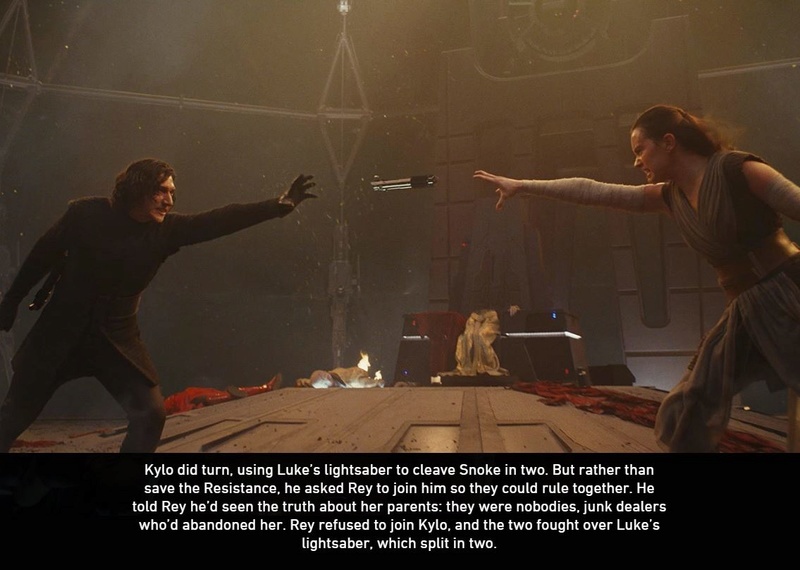 Snoke gets the information about Luke out of Rey, though she fought and fought, he was too strong. How much talk was there about the interrogation in TFA and how Rey 'suffered'? The interrogation in TFA was a walk in the park compared to the interrogation and mind invasion by Snoke in TLJ. Will this experience haunt her at all in IX? will she be changed by it? Being star wars, introspection is unlikely to be seen on screen - but it's possible. Plus, I like to acknowledge what she went through in TLJ - because it's a credit to her how she keeps fighting! And that in spite of the horror of being faced with Snoke, she still had that spark of hope and she never gave up. It's a credit to Rey's character. I am looking forward to seeing how the SW databank describes the throne room scene! One last little thing I'll share.. the main summary blurb on Rey's databank entry has been updated..
-a couple of random thoughts.. interesting that they added the word 'growing' to describe her powers in the existing blurb. I wonder if this hints that her powers may continue to grow in IX! -the all new final line is a great summary of Rey - much more succinct than one of my comments - she experiences disappointment and she looks for a new way forward. I love that. The closer I look, the more I admire Rey's character! I am intrigued by this 'new' direction....just as Snoke is no longer Kylo's 'evil genie' then Rey is no longer obsessed with finding her parents. Both stand at the beginning of a new dawn, so to speak. And just what are their journeys going to be like? Will Kylo try to do some good as Supreme Leader....and will Rey find out that things are not quite as 'black and white' as they seemed? Interesting. 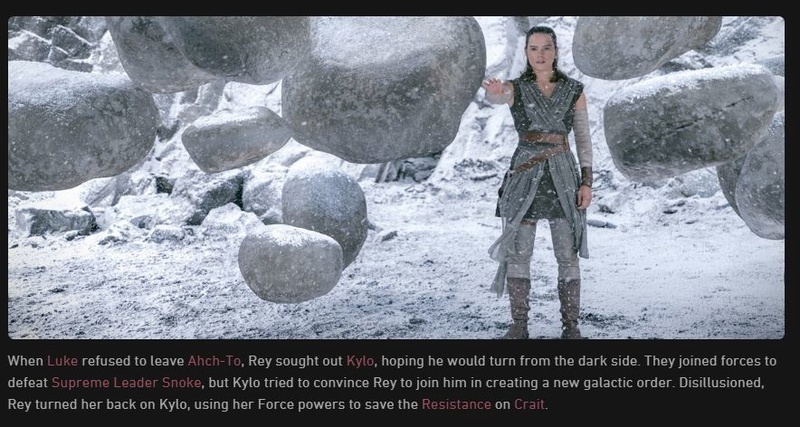 @motherofpearl1 wrote: I am intrigued by this 'new' direction....just as Snoke is no longer Kylo's 'evil genie' then Rey is no longer obsessed with finding her parents. Both stand at the beginning of a new dawn, so to speak. And just what are their journeys going to be like? Will Kylo try to do some good as Supreme Leader....and will Rey find out that things are not quite as 'black and white' as they seemed? Interesting. Hi motherofpearl1. Focusing on Rey's POV, and regarding the bolded - Great point!!! I love how you put this you are so right! at the end of TLJ Rey is right on the cusp of a new direction!!!! Rey is no longer searching for her parents. 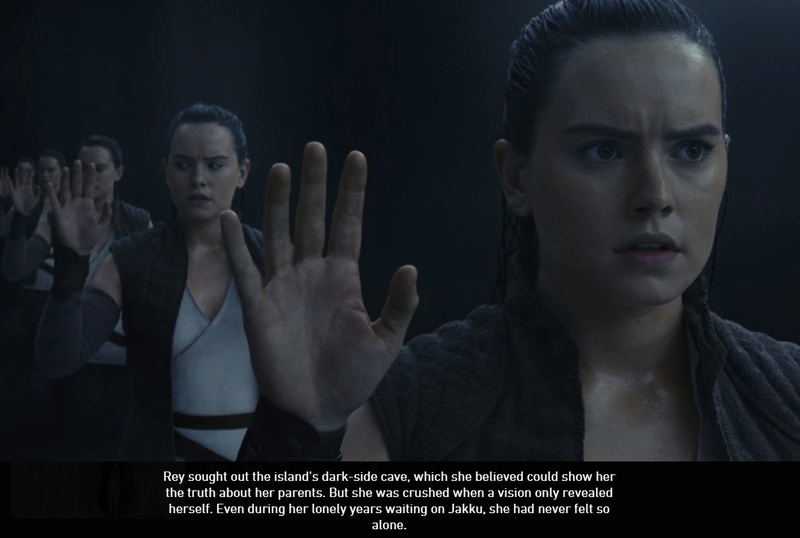 She has worked through that - and she has likely dealt with what Kylo identified as 'her biggest weakness'. Reading the expanded novelisation, there was a lot of content about Rey and discovering and learning about the will of the force, which we didn't get much of in the movie (I think it's there with the peace and purpose moment but it's vague). When I'm in 'a Rey mood' and have some time I'll share a few passages from the novelisation - I found it on pdf so can easily share passages now. so cool! Briefly, I'm thinking Rey's powers and connection with the force have only just recently been awakened and she is a novice.. I think the will of the force is the 'Advanced Cosmic force unit' you take in 4th year of force studies. lol. The most senior of Jedi's grappled with this! Rey's understanding of the will of the force and how she has a role to play, is a big part of TLJ (and likely IX too). Her experience of being confronted with Snoke and his powers is IMHO an important part of her education... I think the novelisation even hints that Snoke is giving her lessons.. Anyway, I need to sign off and come back to this thought.. booo RL calls. bye! I'll resist double posting it. Update to Rey's main page on databank..
What a gorgeous image!!! Go Rey!! 'Disillusioned' - wow that's quite an interesting description of Rey. 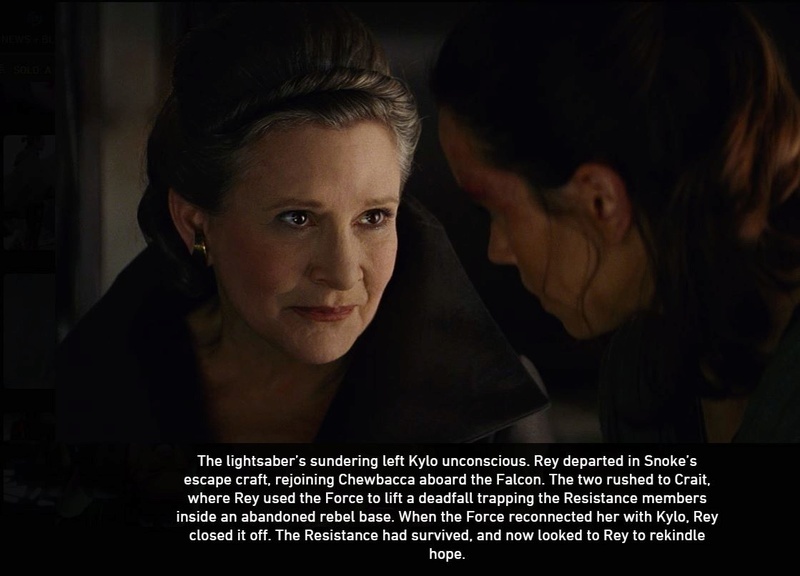 I hadn't thought about that before - lol fans who are unhappy with Rey's being so missing after the throne room are going to love this description.. lol. I can accept Rey was disillusioned, but I don't think we saw it on screen myself.. but YMMV! edited again to add: here are the images from the databank - enjoy! Disillusioned indeed. That's interesting wording? I laughed at "treacherous nephew" LOL. 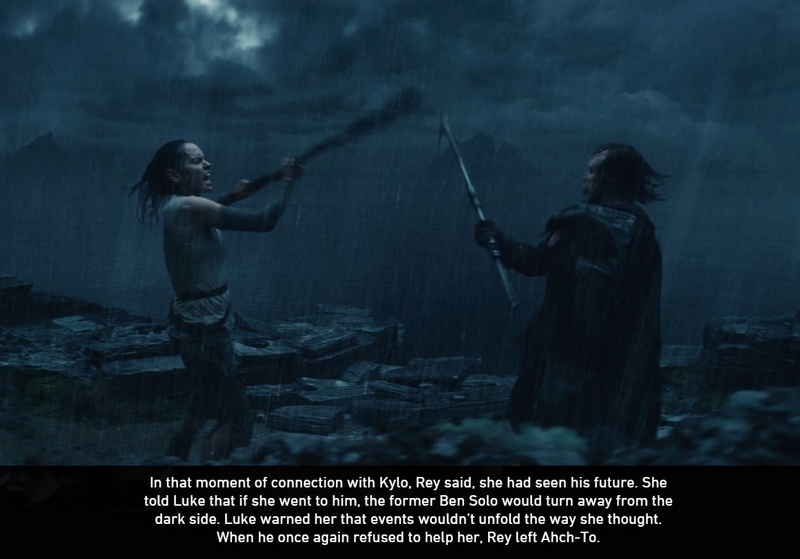 Also interesting wording where it says "Kylo did turn, using Luke's lightsaber"
"When the Force reconnected her with Kylo, Rey closed it off." - whoa! But.. did she close it off permanently?! tee hee.. So much juicy stuff in here.. yeah! good call - Kylo did turn - is a stand out line! Is it him literally turning or metaphorically? He did turn against Snoke.. Oopsie this is the Rey thread. I shared the link in the Kylo/Ben thread but people can quote the comment sharing the slides there if they wish to refer to them. @DeeBee Thanks for your hard work. I really appreciate it. So...Rey chose to close the Force bond. And Kylo let her. Which means its still active post Snoke.